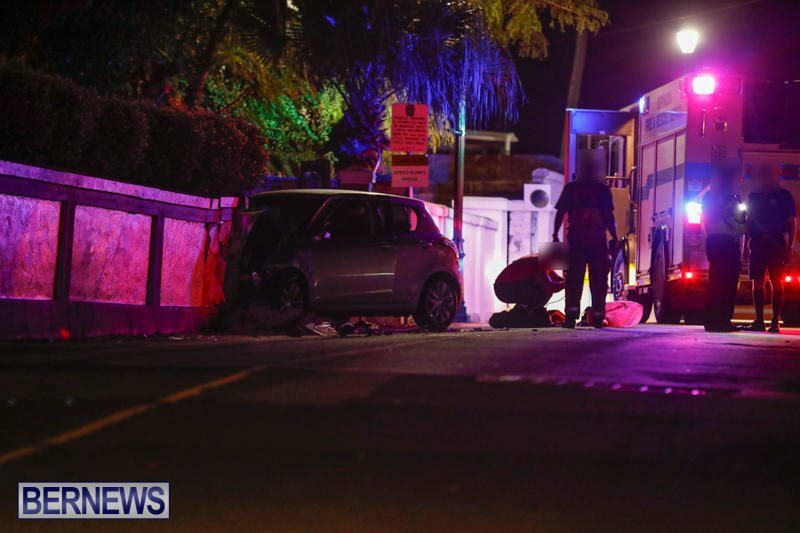 [Updated] The police have confirmed that a 30-year-old man has died following a collision on York Street in St. George’s. Police, Bermuda Fire and Rescue Service, and an ambulance attended the scene. Traffic was diverted away from the scene as York Street was blocked to traffic. Police Media Relations spokesperson Robin Simmons said, “Around 11:40pm Saturday‎, October 28th police and first responders were dispatched to a reported serious single vehicle car crash on York Street in St. George’s near the junction with Fort George Hill. “It appears that two people, believed to be a 29-year-old Warwick woman and a 30-year-old Devonshire man, were in the vehicle when it struck a wall. “Both were taken to King Edward VII Memorial Hospital via ‎ambulance where sadly, the 30-year-old man was later pronounced dead. “At last check the 29-year-old woman was receiving treatment for injuries that are not believed to be life threatening. “She is expected to be arrested on suspicion of impaired driving as inquiries continue. “Identification of the deceased is anticipated in due course once next of kin has been notified. “Traffic was diverted away from the area for over two hours while the scene was processed by the relevant police personnel. Update Oct 29, 7.53pm: The police have now confirmed the death of 30-year-old Rakai Augustus. The full statement is here.